Own an apartment in Les Saisies, a family friendly resort renowned for breathtaking panoramas. The resort of Les Saisies has an exceptional snow record, which has earnt it the nickname ‘snow barn’ of the Savoy. With 77km of slopes, the domain of Les Saisies is ideal for beginner skiers and proficient skiers alike. 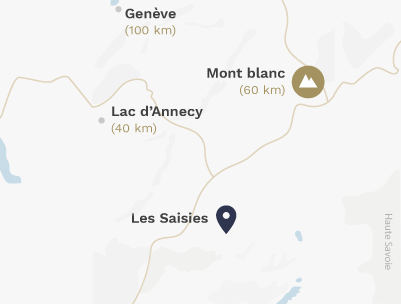 It is part of the much larger linked Espace Diamant, linking the village resorts of Hauteluce, Les Saisies, Crest-Voland, Praz-Sur-Arly, Notre Dame de Bellecombe and Flumet with over 192 km of slopes. Panoramas to take your breathe away ! Nestled into the mountain facing Mont-Blanc, at 1650 m altitude, the resort has spectacular scenery. No matter what the season, le Beaufortain is at the heart of nature. The domain offers several racket shoe walking trails and trekking trails, which the resort is also renowned for. « Residence Amaya » is composed of high quality apartments, concieved to offer you unforgettable holidays in the mountains. Underfloor heating, totally equipped, private balcony, all the finishes are thought of with your comfort in mind. Situated in the heart of the Tarentaise range, Valmorel is one of the most beautiful resorts in the Alps. If you are looking for a chocolate box dual-season village resort, Samoëns will without doubt live up to your expectations.